What a great idea for a novel – take the most famous evolutionist in the history of science, a son who didn’t exist and construct a ‘factitious’ biography of said son’s ‘Life and Collected Works’. Thomas Darwin is purported to be the youngest son of the famous Charles, daughter of Emma (née Wedgwood, yes the pottery people). His mum and dad are first cousins (a trifling matter, but neatly ironic). Thomas is a bit of a strange child, ‘alone but not lonely’ and more than likely to follow in his father’s footsteps, except – as we already know from the cover, and the Preface (but keep forgetting because we’re so drawn into this life story) Thomas will die in an insane asylum by the time he’s 21 and his ‘life’s work’ will culminate in an ultimately flawed study of the evolution of inanimate objects. I loved the premise that inanimate objects actually evolve. I’m moving house soon, and while reading the book in the pre-move sorting out phase, found myself noting three generations of apple macs, the leap in evolution from the 56k dial up modem to wi-fi router, food processor via pestle and mortar – getting carried away now, I don’t own a food processor – but you see where I’m going. I was intrigued and totally taken up with Thomas’s theory, until I spot the flaw, the uh-oh moment when the reader realises that Thomas Darwin is insane. Harry Karlinsky is a clever guy. Not only is he a Professor of Psychiatry, but this little book (just over 200 pages) is his debut novel. The reason it works so well? Not only is the biographical format anatomically correct and wonderfully annotated (watch out for footnotes that contradict the text! ), but because it tells a very human story. 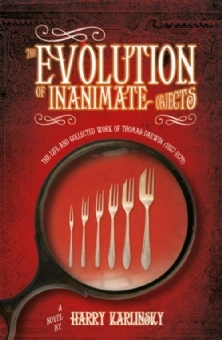 The Evolution of Inanimate Objects: The Life and Collected Works of Thomas Darwin (1857-1879), Harry Karlinsky. Published by The Friday Project (Harper Collins imprint). 2012.